For the last three and a half years, White Noise has been creating hype in society to challenge drug laws in Georgia. This article by Alina Krushynskaya originally appeared in Belarusian at 34mag.net, a leading source of information on Belarus. We are grateful for their permission to republish it here. 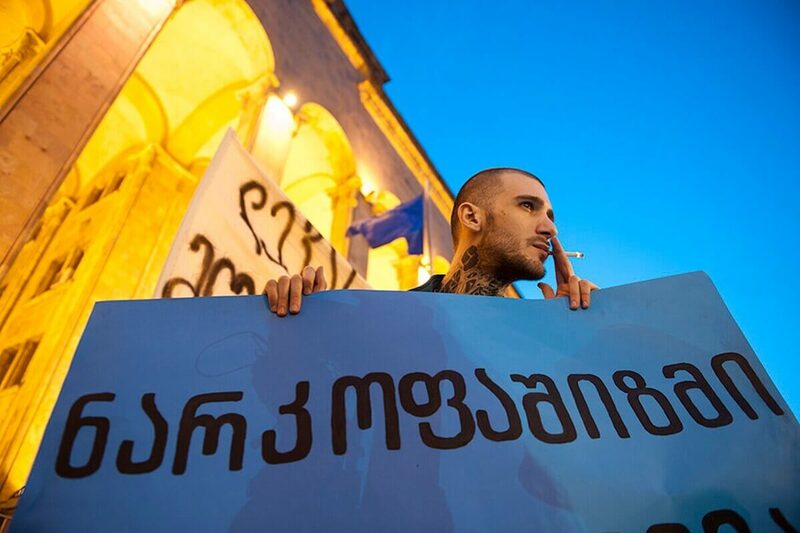 In continuing their coverage on the experiences of international activists focused on the struggle against the injustice of authorities in their home countries, 34mag.net this time has talked to a Georgian activist, David Subeliani. They discussed inhumane drug policies in Georgia, he and his friends’ approach to getting people released from police custody, and how their actions are affecting the decisions of the Constitutional Court and changing public opinion. David Subeliani is one of the leaders of the “White Noise” movement, which advocates drug decriminalization in Georgia. 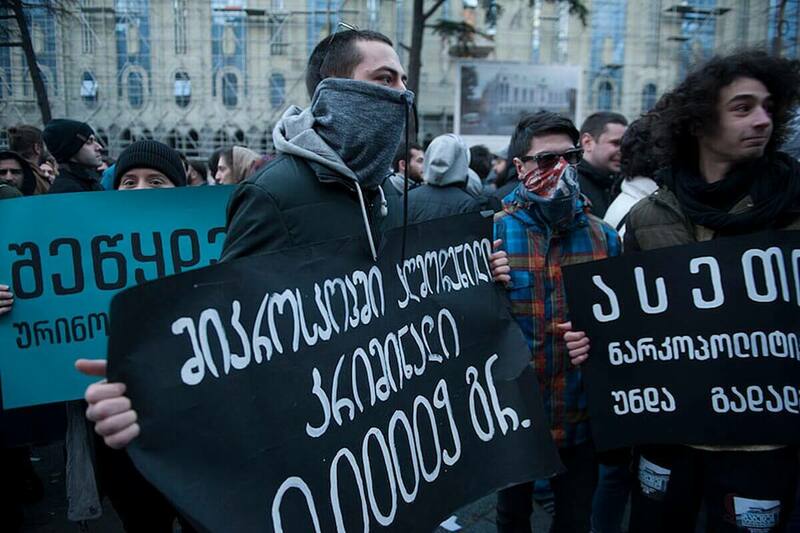 The movement has run into, understandably, numerous struggles with police, state ministries, parliamentary offices police stations, and on the streets. Although Georgia has partially decriminalized the personal use of cannabis, local drug policy still remains one of the most repressive in the world. More than 300,000 people – almost 10% of Georgia’s population – have been street tested for drug use over the past seven years. People get 6-8 years in prison for scanty traces of substances, revealed under microscopes in police laboratories. Krushinka: Can you tell me a little about the beginnings of the organization’s activities? David: Formally, “White Noise” is not an organization, but a horizontally controlled group of people who believe that it’s necessary to do everything for changing inhumane drug policy in the country. It started in 2013 with the artist Beka Tsikarashvili. The police caught him with 65 grams of cannabis and threatened him with 6-8 years in prison. Somehow, based on his story, a different and new media campaign emerged under the slogan, “Beka is not a criminal!”, and focused on simply telling guy’s life story and those of his family members. This challenged the idea regarding what the typical attitude of a person who uses drugs is. Prior, all were likened to a junkie, a goner; people have little sympathy for and solidarity with such types of persons. So Beka was something different. It became obvious that there is something wrong with drug policy in this country. People began to talk about it. The campaign lasted a few months and was lead by Beka’s friends – very energetic people who protested in an uncommon way, creating information noise within the city and country. The case received wide public attention. The police and the government retreated, and as a result, he didn’t go to jail, and the case was closed. Then something surprising happened. We appealed to the Constitutional Court on the unconstitutionality of adjudication that hung over Beka. The judges reviewed it for a few months, and we won the case! It was a great victory. Not only because Beka avoided a prison sentence, but also because hundreds of prisoners for the same charge were immediately released. All this gave extra energy and new strength to the struggle and the movement’s expansion. In December of 2015, we started to run a campaign, “White Noise.” Its concept is to create hype in society, as this will be uncomfortable for authorities. For three and a half years, “White Noise” has been a real brand in Georgia. Many organizations say that the state should be allowed to carry out gradual changes. But there is no time for gradual changes, we must completely change the policy in this area right now. We stand for the need make a public agreement that drug users are not criminals. Our request is to agree on the issue, and then we can discuss the details. This is our goal, our vision. Now we have 3-4 constitutional cases. One of them concerns the fact that the cultivation of narcotic plants cannot be punished with prison time. Another case focuses on the size of doses considered to be non-criminal. People are punished for even tiny doses of “krokodil” [desomorphine*] in Georgia. Certainly, it isn’t cool to use it, but people do. Police find tiny doses of it in confiscated needles after usage under laboratory microscopes, and people get 6-8 years in jail for it. Is the news about partial decriminalization of drugs, which spread around the world last December, due to your merit? The news didn’t correctly interpret what had happened. There are two constitutional regulations, which technically even haven’t started working, about dry and wet marijuana. They say that the storage of up to 70 grams of cannabis in dry form, or up to 200 grams wet, cannot be regarded as a criminal offence, which leads to punishment in prison, because this is against the constitution. So, now if you get caught with such an amount for the first time, a court may declare you a criminal, but you can’t be imprisoned. Therefore, it can’t even be called decriminalization. So far, drug possession in Georgia is a criminal offence. Very, very small amounts can be considered as goods. Of the 270 drugs in the list of prohibited substances, two-thirds don’t have gradation (min/medium/large). This gives the court ample opportunity for deciding how to penalize – with an imprisonment or a fine. For example, desomorphine doesn’t have a “minor amount.” This means that even if you get caught with 0,000-something, it automatically goes into an “extra-large” dimension, and you get the maximum number of years in jail. The new generation of synthetic drugs in general are not subject to administrative regulation, only criminal. No matter what you get caught with, what you use or how much you store, it automatically becomes a matter of criminal court. The law is so clumsy that most people who deal drugs end up with prison time or a fine of 30-40 thousand lari (€ 12 000-15 000). Due to one night in a club, people have to sell their property. To decriminalize all kinds of substances, we propose to define the relevant permitted number of storage for each of them. For example, in Portugal, it is up to 10 grams of heroin for 10 days. Expert calculations were made, which made the decision. We propose to determine a three-day dose permitted for all substances: cannabis, medical psychoactive substances – heavy and soft drugs. We have determined this through consultation with doctors and experts to start working on coming up with regulations on the amount of substances, so you can’t be put in prison. There are 50 thousand people (more than 1% of the population) using hard drugs in Georgia. Only 5000 of them can use the substitution (methadone) therapy. And the state spends 3-4 times more money on the penalty of imprisonment and street testing. What is this street testing for drug use? How does it occur? In our country there is a unique approach to this, people are taken off the street for testing. Actively, for no reason, without any discredit. And only 30 percent of them will be revealed to have some traces of drugs in their systems. 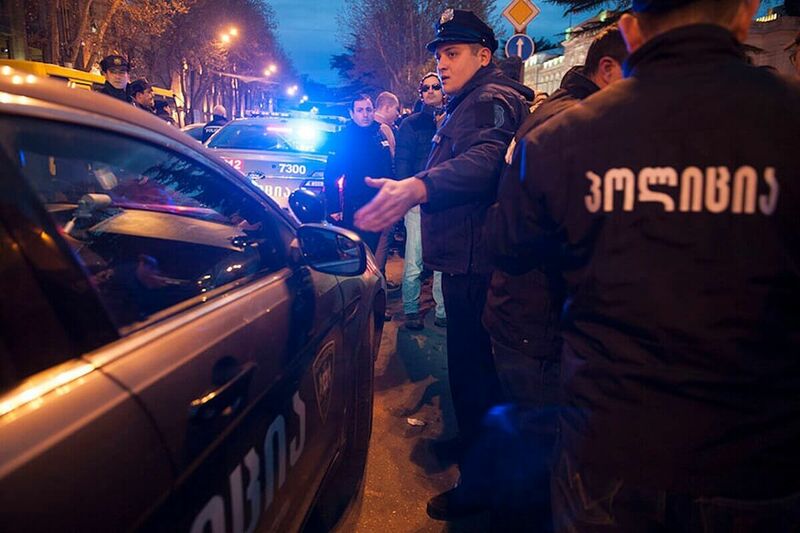 We conducted a long campaign against street testing and have achieved a lot: the number of people who are taken to police laboratories has significantly decreased by at least 50 percent. But all the time police are trying to find new ways to punish people. They can just come to you on the street and say, “Hey, seems you are high, follow me.” But there are constitutional rules that allow for resistance. You can say you won’t give your urine for analysis because it can be used against you. After our information campaign, people refused to take urinalyses at police stations. But police pressure on them, threaten their families. For them, this is a way of making statistics and filling up the courts. Now people are almost never taken from the street for testing. Firstly, because we have created a precedent in the Constitutional Court. Secondly, as people become more proficient about their rights, they know they can refuse. Thirdly, we react promptly on the spot. When friends or relatives of people are grabbed by the police and call us, we immediately go there, attract media attention, create a hype. We joke that sometimes we need only 10 minutes to get a man out of the police station. Sounds weird to think about it. As in many other countries, which pursue tough drug policy, the poor suffer the most. 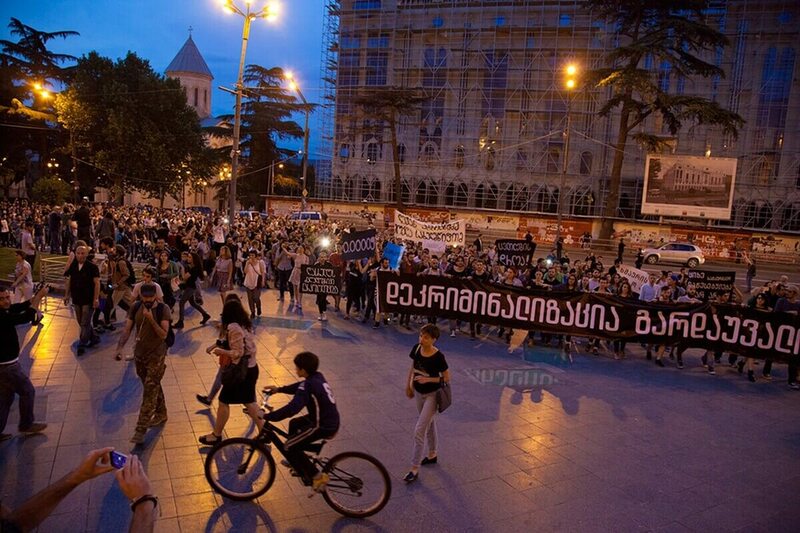 Tbilisi and central regions still adapt somehow; people find money, try to defend themselves. But in marginalized regions, people without income or property spend years behind bars. Its reminiscent of combat actions, like a battlefield. And there already have been tragic cases. 50-year-old Lyavan Abziyanidze was coming home one night, tired and poor, when police stopped him and asked to do a test. He refused and was taken to the police station, where he spent a couple of hours. He could not pee because he had problems with blood pressure. They gave him diuretic pills that affect blood pressure, took his urine, and soon released. On the way home, on the street, he died. There was a long investigation. We insisted that the state killed the man. A few days ago, we got an answer from officials stating that those pills couldn’t have lead to his death. But we doubt the expertise. That is not a question. Another man, a young guy, committed suicide after he was chased by a police officer. The guy left a letter to his mother, where all the persecutions and threats were described in detail. A very dark, dirty story. We came to his city and held a rally in front of the police station. We clashed with police and wrote on the police officer’s car that he is a murderer. 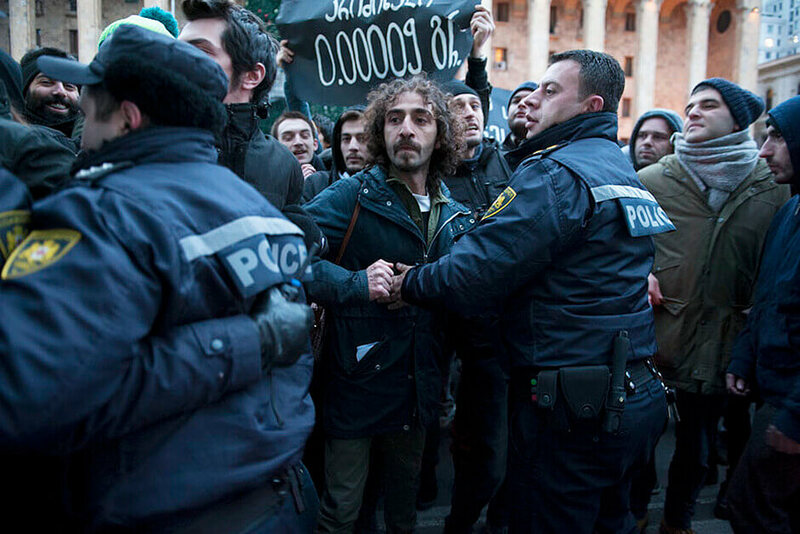 After we left the city, police began to arrest our comrades. We went back and released all detainees with the help of media. How does “White Noise” convey their demands to authorities? What, in addition to information campaigns and street protests, are your methods? The last year and a half has been a very significant time for our movement. In addition to the media and street companies, we work with experts, NGOs, and government representatives. We’ve worked on a bill draft with a proposal of carrying out drug policy methods throughout the country, drug abuse prevention, replacement of imprisonment, and street testing termination. We strongly rely on Portuguese experiences with drug decriminalization, which focuses on a social assistance system aimed at drug users. We look forward to changes in April-May. Plus, we demand the change of laws prohibiting drug users to work as drivers, because there is no other work but to drive a tractor or truck in many regions. If you think that drug use is a disease, but do not give any treatment and do not let users work, what do you expect from these people? Of course they will use even more and sell their TV-sets to buy a dose. We work closely with the Parliamentary Committee of Health and Social Protection. These are the best people in Parliament who are openly on our side. After all, this directly concerns health issues. At the same time, there are reverse processes in the government: the Minister of Justice and Minister of Internal Affairs keep pushing back decriminalization. It’s like, “We know it must be done, but we’re not ready for it.” They offer to postpone it for years. This is the typical thing heard. Politicians pretend to cooperate, but in fact, they are simply trying to calm us down. Another example of this support is our opening of a hotline for legal assistance. Previously, people could contact us by personal number, but it is not very convenient. It is important to be fast, be in touch, because during the first 45 minutes the police erect false accusations, and all documents are signed. That is why we are starting the official line, for which an easy-to-remember number has been needed. We would pay hundreds of dollars for it, but the telephone company gave it free of charge. Now we negotiate with the ombudsman to place ads at police stations. He has the legal right to put whatever he wants in every public institution, including the police. Can you imagine what kind of madness it will be! Sometimes I am very tired and want to spend time with my family and children; I have three kids. But when I see such problems, I can’t sleep well. Now we feel personal pressure, before the final battle to come. For authorities, a logical move is to show that some of us take part in something very bad, drug distribution, and so on. That’s why we strive to be accurate. 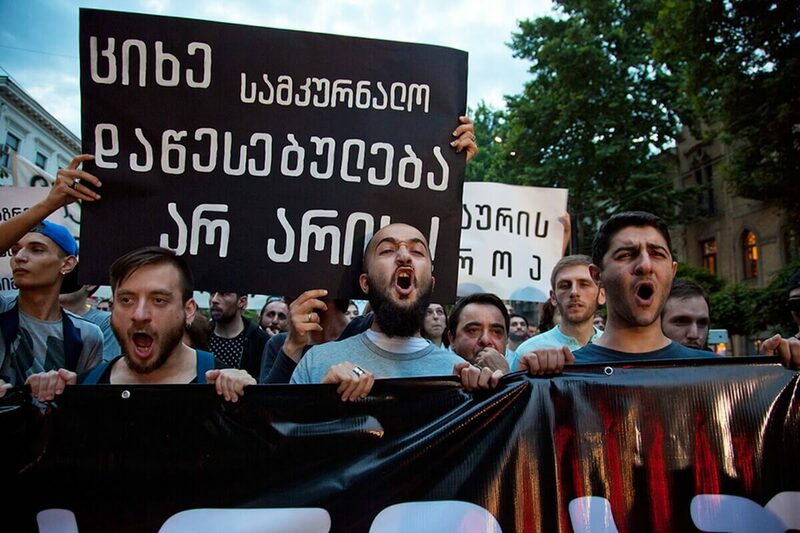 But the political situation in Georgia is changing very quickly. They say, the political crisis will happen, the prime minister can retire. If this happens, it will be very bad for us. If the current system begins to change, they will not be up to our reforms. So, for us it’s a bit tragic situation. This piece was originally published on 34mag.net’s website. Featured photo courtesy of Eana Korbenadze. Alina Krushynskaya is a Belarussian journalist, photographer, and project coordinator. She holds an M.A. in Gender Studies and contributes to 34mag.net's online magazine.